Scotland’s first full post mortem of a humpback whale – found dead at Fishnish on the Isle of Mull this week – was carried out yesterday by veterinary pathologists with the assistance of conservation charity Hebridean Whale and Dolphin Trust. 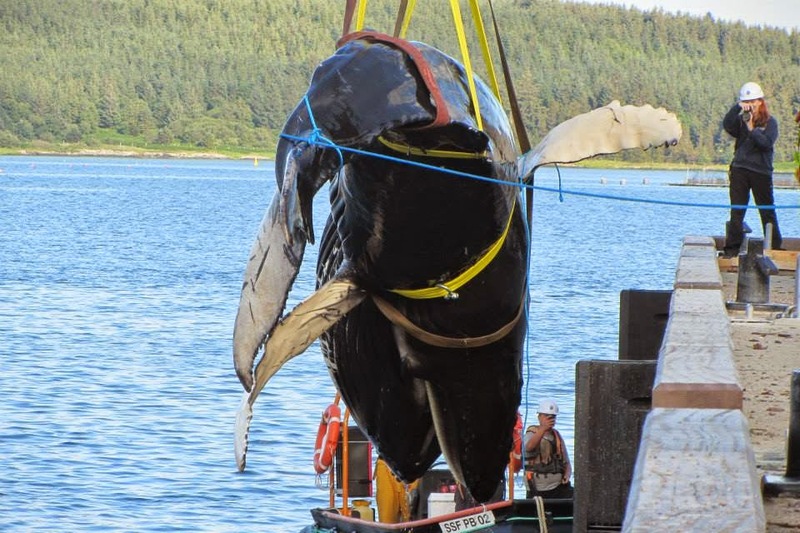 The seven-metre, eight-ton animal – believed to be the first humpback whale ever to strand on Mull – was discovered floating close to shore on Wednesday 25 June, and was craned out of the sea the following evening. The male calf had not recently been feeding and was probably still dependent on its mother. 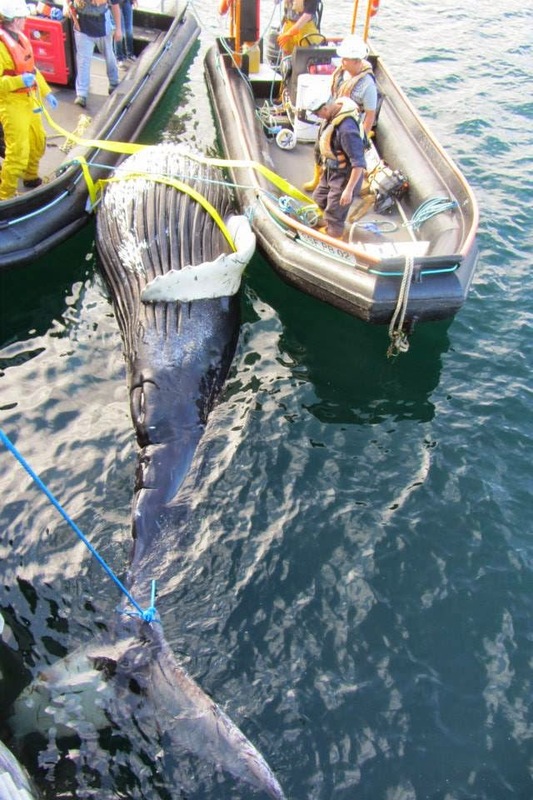 Hebridean Whale and Dolphin Trust’s Science and Strandings Officer Dr Conor Ryan, who is an expert on humpback whales, assisted with a post mortem examination with veterinary pathologist Andrew Brownlow of Scottish Rural University College to establish the cause of death. Preliminary results from the examination were consistent with drowning, although the cause is unclear. “This highly unusual and sad discovery is a reminder that Scotland’s west coast waters are extremely special and host a great variety of marine species, including magnificent and iconic humpback whales – and that conservation action and research are vital for the protection of such remarkable animals,” said Dr Ryan. Humpback whales today face a range of threats including collisions with vessels, entanglement in fishing gear, pollution and reduction in stocks of their prey. People are encouraged to report sightings and strandings of whales, dolphins, porpoises – collectively known as cetaceans – to the Hebridean Whale and Dolphin Trust via www.hwdt.orgor on 01688 302620. The charity’s Community Sightings Network works with residents and seafarers across the Hebrides to map cetacean distribution off Scotland’s west coast as part of its work to ensure the long-term survival of cetaceans and basking sharks through improved knowledge and understanding. Humpback whales (Megaptera novaeangliae) are rarely encountered in the Hebrides but are known to migrate through the region far from shore when travelling between their tropical breeding grounds and Arctic feeding grounds. They were hunted in the Hebrides in the early 1900s, but only 19 were caught during 20 years of hunting – suggesting they had been over-exploited by whalers elsewhere to the north and south of Scotland. Although sightings are still very rare in UK waters, this species is being observed with increasing regularity in Irish waters. Named after the distinctive hump in front of their small dorsal fin, humpback whales are known for their acrobatic aerial breaching and for complex and beautiful songs performed by males during courtship. Adults can range in length from 12-16 metres and weigh up to 36 tons. Humpback whales are widely distributed throughout all the world’s oceans and are highly migratory, travelling thousands of miles from warm-water breeding grounds in the tropics to cold-water feeding grounds in the polar regions. The species has an estimated global population of 60,000 individuals and is increasingly popular with whale-watching trips worldwide.